Integrating automation systems requires an experienced team of creative individuals who can take the engineer's and the customer's ideas and dreams and turn them into reliable, efficient and productive factory automation systems. 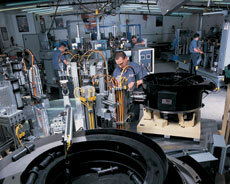 Our custom engineered solutions can tie into a wide range of existing automation systems or components. We can build and integrate our systems into initial designs, or we can build systems that maximize the use of a customer's existing automation equipment, which saves costs and makes systems more flexible. We can also integrate other company's components into our automated systems as needed, including ultrasonic welders, conveyors, other vibratory feed equipment and more. For further information or a free quote on integrating an automation system, contact Dial-X Automated Equipment, Inc.